Airline revenue derived from the sale of so-called ancillary services continued to rise last year based on the newly released report, 2015 Top 10 Ancillary Revenue Rankings. Conducted by IdeaWorksCompany and sponsored by CarTrawler, researchers dug into financial filings made by 135 airlines worldwide, 67 of which disclosed qualifying revenue activity, and determined that ten airlines earned a combined total of nearly $26bn in ancillary revenue during 2015. That represents more than a three-fold increase from the $8.39bn the top 10 airlines earned in 2008, the first year the report was published. Ancillary revenue is revenue gained from retail activities, à la carte services including food and beverage and checked-bag fees, the sale of frequent flier miles, commission-based products and miscellaneous sources such as advertising. The carrier that reported the most income from ancillary revenue in 2015 was United Airlines (NYSE:UAL), which also topped the list in 2014 and 2013. The Chicago-headquartered airline reported nearly $6.2bn in ancillary revenue, up from more than $5.86bn in 2014 and $5.7bn in 2013. American Airlines (NASDAQ:AAL) reported $4.7bn, only slightly higher than the combined total of $4.65bn in 2014 for American and its merger partner US Airways but up significantly from a combined total of $3.18bn in 2013, when the two carriers reported separately. Delta Air Lines (NYSE:DAL) continued to occupy third place, deriving nearly $3.8bn from ancillary revenue compared to $3.21bn in 2014 and $2.53bn in 2013. Air France/KLM was fourth with approximately $2.16bn, an increase from $2.05bn in 2014 and $1.71bn in 2013. Southwest Airlines (NYSE:LUV) bumped Ireland-based low-cost carrier Ryanair out the No. 5 slot with nearly $2.12bn in ancillary revenue. Rounding out 2015's top 10 were Ryanair with $1.74bn, Lufthansa Group with $1.49bn, easyJet with $1.47bn, Qantas Airways with $1.17bn, though that was mostly from the transactions related to its frequent flier program, and Seattle-headquartered Alaska Air Group (NYSE:ALK) with $1.09bn. While airlines all over the world benefit from ancillary revenue, the degree to which airlines disclose financial results varies. Financial statements for U.S.-based airlines universally provide a high level summary of ancillary revenue results while publicly held low-cost carriers almost always make direct reference to ancillary revenues achievements due to investor interest in the topic. It is a logical corollary that airlines with low average fares will have the highest percentage of total revenue derived from ancillary services, according to the report. Since 2011, the top slot has been held by U.S.-based Spirit Airlines (NASDAQ:SAVE), which is conspicuous among consumers and regulators for its aggressive pursuit of à la carte sales. The airline has a policy of “no waivers & favors” for enforcing its fee structure. 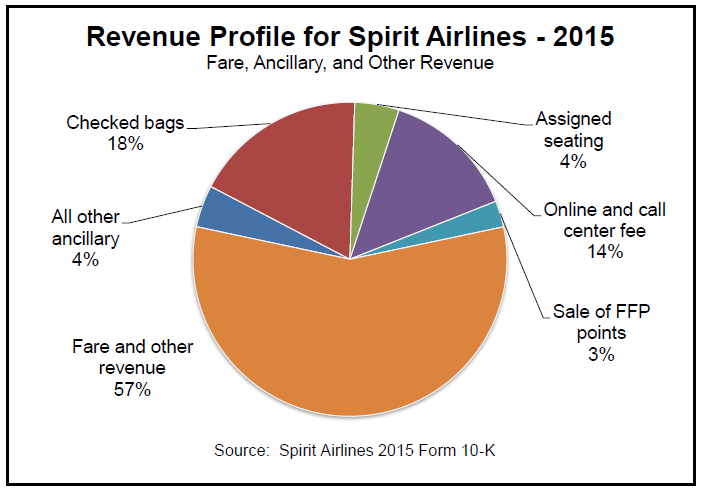 In 2015, Spirit derived 43.4 percent of its total revenue from ancillary services, up from nearly 39 percent in 2014. Allegiant was second, obtaining 37.6 percent of its total revenue from ancillary sales. Wizz Air was third at 36.4 percent, U.K. low-cost carrier Jet2.com was fourth at 29.4 percent and Ryanair was fifth at 24 percent. While ancillary revenue overall is up across the board, the amount obtained from each passenger, on average, is mixed. Spirit topped the list of ancillary revenue per passenger, obtaining an average of $51.80 from à la carte fees, but that marks a decline from its figures for 2014 when it obtained an average of $52.35 per passenger. The highest per-passenger average for 2015 is also lower than in 2014 when Jet2.com topped the list with $56.28 per passenger in ancillary revenue. In 2015, Jet2.com obtained $50.84 per passenger. Other carriers that saw declines in the average amount obtained from each passenger include Qantas, which dropped to $42.70 in 2015 compared to $50.16 the previous year and Malaysia’s AirAsia X, which declined to $35.01 per passenger compared to $43.22 last year. CarTrawler and IdeaWorksCompany will release a compilation of results and overall rankings from the 67 disclosing airlines in September 2016.